In the beginning, there was a man, a motorcycle and a dream. 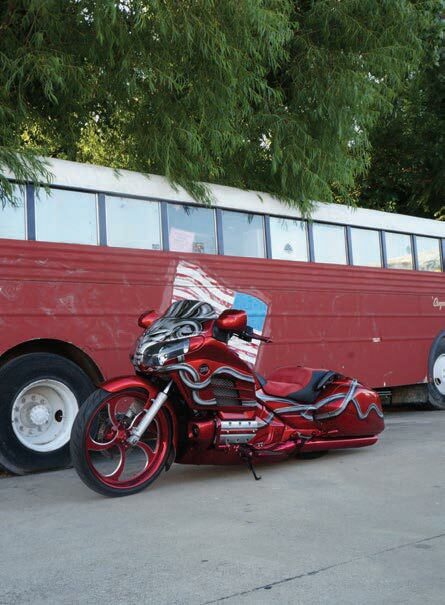 My dream to build a truly unique, big-wheel bagger was more of a challenge than I expected. Obviously, customization is key to making a bike “your own,” but that still was not enough for me. Even though each one is its own custom work of art in its own right, I still wanted to stand out. On the other side of that coin, I also wanted something with more features and comfort than your typical bagger could provide. In late July 2015, I purchased a pre-owned 2013 Honda Gold Wing F6B from a local dealer. Gold Wings are some of the most comfortable and featurerich bikes, but the idea of turning it into a big-wheel turned out to be greatly frowned upon in the Gold Wing community. 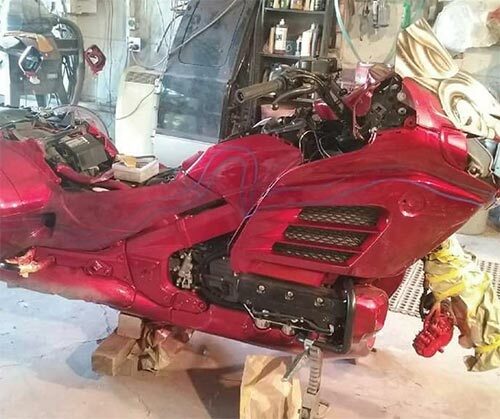 To bring my dreams to reality, I began scouring the internet for ideas on how to turn this F6B into something that set itself apart from the traditional Gold Wing look. After quite some time searching resources, all I could fi nd were the typical Gold Wing accessories, including stick-on chrome and lights galore. This was going to be harder than I thought. In order to achieve the look I desired, I realized that I would have to reach out to the Harley community. I started calling custom bike shops in the Dallas/Fort Worth metroplex. Even the pros were highly skeptical. Despite all the haters, I was determined to have one of the first F6B big-wheel baggers in the United States (if not the world). Most of the shops I contacted were either not willing or able to do customizations beyond the traditional scope of work typically associated with Gold Wings; and all of them were certain it would be impossible to fit a 23-inch rim on this bike. As my frustrations mounted, I realized I was going to have to do the lion’s share of the work myself. Fortunately, I had a strong group of friends and an especially understanding girlfriend who helped me fulfill my dream in spite of the fact they thought I had lost my mind. O ne of the most obvious changes would need to be a new paint job. Deciding upon the paint scheme was a bit challenging. Red? Blue? Solid? Stripes? The possibilities are endless, as anyone who has customized a bike knows. One thing I knew for certain was that the bike demanded a deep and vivid candy color. After searching several paint stores and websites, I decided to use Them Apples Red with a So Bright Silver base from allkandy.com. Once the color was on the bike, I turned my attention to the artwork. Knowing I wanted a Medusa theme, I contacted Jerome at Getagrip Airbrushing. I knew he was just the artist I needed to lay out what I had in my mind. Before long, he and his crew began stripping my bike into pieces; and after an agonizing two-month wait, the airbrushing was complete. Finally, I covered it with Wet Wet Plus high solids clearcoat to give the candy a deep, rich luster to serve as a background for some artful airbrushing. Next stop … Bonnie and Clyde Car Audio to get the speakers and amplifier my bike required. They are also a good source of LED lights to give me a great under-glow e£ect. Overcoming the wind noise caused by high speeds is a major concern; therefore, I contacted Big Luis at Bonnie and Clyde’s who worked hand-in-hand with London Sound’s audio guru, Greg London. Together, they devised a fantastic remedy. We upgraded the front speakers to 6 1/2-inch Diamond Audio technology, which included built-in LEDs that complement the under glow perfectly. Choosing a 6 1/2-inch speaker was a great, albeit difficult, solution as it was a very tight fit. Two 4-inch CT Sounds speakers were added to the front storage compartments to add more front staging at highway speeds. Installing these speakers was simple. We merely cut two holes in the compartment lids, and the speakers dropped right into place. In order to attain some mid-range bass, two 6 inch by 9 inch Diamond Audio speakers were added to each saddlebag. Additionally, a Diamond Audio 400/4 amplifier was installed on the inner wall of the bag to maximize remaining cargo space. 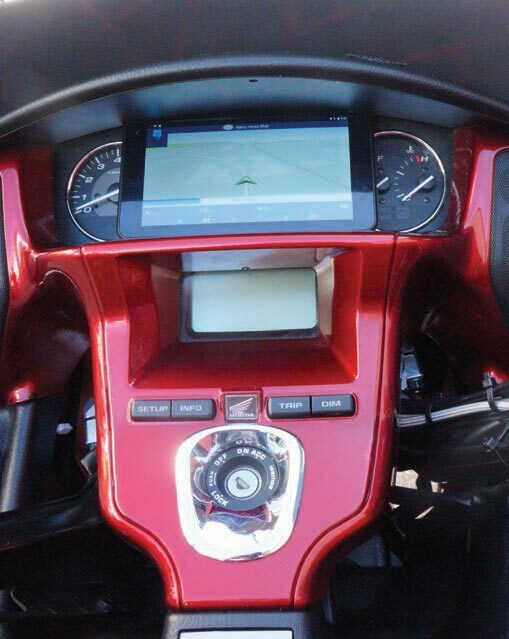 Finally, it was time to add a 7-inch removable tablet in the instrument cluster. 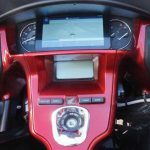 The newly installed tablet serves as the speedometer and navigation system, as well as the control center for my sound system. Believe it or not, all of this work was completed in one day. My confidence increased as I overcame challenge after challenge with relative ease. I was feeling good about the direction my dream was heading, however two major barriers stood in my way. The factory ride height of a Gold Wing is certainly not conducive to building a dropped down big-wheeled bagger. Lowering the ride proved to be exceptionally di¤cult. 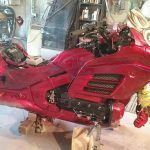 After speaking with companies that fabricate air-ride systems for similar motorcycles, I was met with the same challenges from the beginning of my endeavor. Although the parts existed, none were available for the F6B. As I looked at the kits o£ered, I noticed several similarities, such as the same compressor and shocks. The only di£erence I could discern was the names on the labels. All of that sorted out, I purchased an air compressor and a shock to lift my bike. I was mistaken … $ 400 was wasted on buying shocks that were incapable of supporting the weight of the bike. I had hit a brick wall. What was I overlooking? I had to use a lifeline and decided to phone a friend. Grandpa actually. Papa Rubin is a retired machinist and he was able to help me see where things had gone wrong. He helped me determine that a larger cylinder would get the job done. Focusing my attention on the air cylinder, I searched for, and eventually found, one large enough to lift the bike, yet small enough to fit in the limited space available. Installation was time consuming but not too difficult. H aving completed the task of mounting the new cylinder to the bike, I noticed another issue. Much to my dismay, the new equipment only lowered the bike a mere 2 1/2 inches. To my delight, my buddy Glenn and I were able to come up with a low-tech solution by altering the tire size. The caveat was, we would have to use a car tire. We began playing around with various sizes and were able to come up with one that lowered the bike an additional 3 inches. We used a Federal 165/40/16, which almost allows me to lay the bike on the ground in the rear. When I plan on doing a high mileage trip however, I switch to a Federal 195/45/16, which allows for better ground clearance when fully lowered. The final challenge was at hand. A game changer … a seemingly Sisyphean task … the thing that even the pros said could not be done. The one thing that would set my bike apart from the rest of the custom Gold Wings – that’s right – the big wheel. With a face like Medusa, she deserved nothing less than a titan of a wheel. The issue is, no one I had talked with had ever seen anything larger than a 21-inch wheel on a Gold Wing. To accomplish my goal, I began by measuring a 23- inch rim with a tire. Armed with these measurements, I visited Joe at RPM Cycle in Dallas. He, like everyone else, thought I was nuts. Luckily they had a Gold Wing with a rake kit already installed that I was able to measure. I was beginning to think I could actually pull this off, but there were no guarantees. It was time to pull the trigger. I contacted Mike and Adam, two great guys at FTD Customs in Tennessee, who ordered the rim in a matching Candy Red along with a 6-degree rake kit from Hawg Halters. This was the most nerve-wracking part of the build. Essentially I was taking a $2,000 gamble, hoping and praying that this one-off rim fits. While I waited for the wheel to come in, I worked at modifying the linked braking system. Once again, Joe from RPM Cycle helped me out by providing me with a detailed schematic. I used this drawing to help me remove the rotors and caliper from the left side to show off more of my new rim. The next four weeks were the hardest wait of the entire project. I still wasn’t sure if this was even going to work or be a complete waste of money. Finally, my wheel had arrived. Much to my amazement, the wheel bolted right on with minimal e£ort. After a couple of adjustments, I took to the road. You should have seen the smile on my face. It rode like a dream. With the hard work done, all that was left was to add some detail. 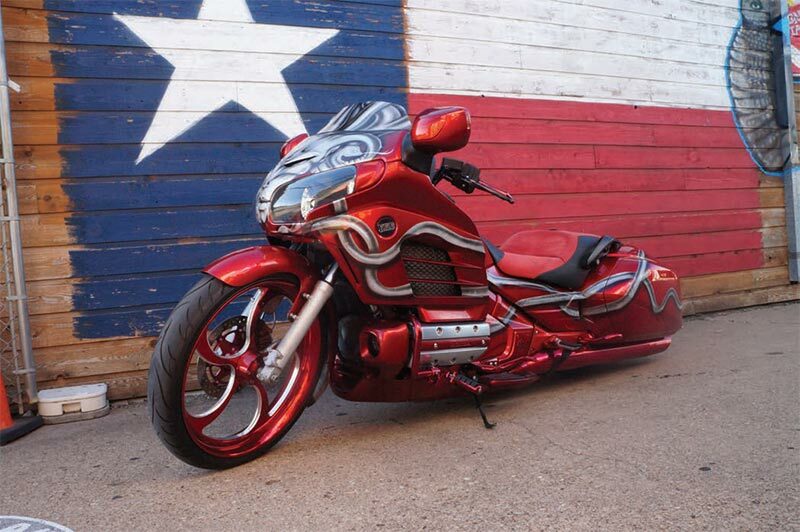 I had all the chrome on the bike, including crash bars and exhaust, covered in Red Kandy Krome at Wheel Technologies in Dallas. After almost a year, I had fulfilled my dream of a Gold Wing F6B Big-Wheel Bagger. I am extremely happy with the results, and despite everyone who said it couldn’t be done, the bike now has a significant following around Texas and the United States. I have accomplished several of my goals, including keeping the bike highway ready. Believe it or not, I make an 800-mile round trip to Calhoun, Louisiana, every other month so that I can visit my grandparents, and it’s as comfortable as ever. My other hope is to attract a younger crowd to the Gold Wing community and let them know, this isn’t your daddy’s Wing. Posted 08/22/2016 by wing & filed under Featured, Gear, Tech. 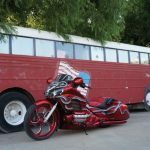 My dream to build a truly unique, big-wheel bagger was more of a challenge than I expected.